It’s that time of the month. No, not that one, the one you enjoy! 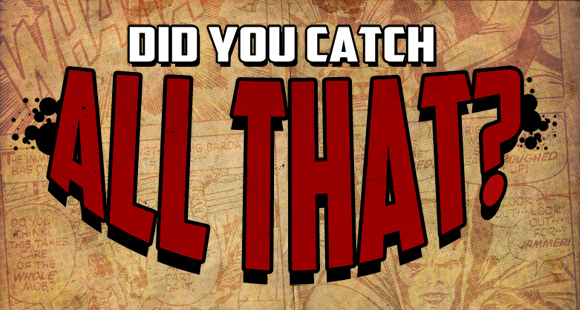 Simon, Sheldon, and Susan come together to give you the highlights of the past month in all new June 2011 episode of “Did You Catch All That?”! DC Comics has a reboot coming up in just a few months, so Sheldon and Simon talk about its impact on the comic business as well as what books they can’t wait for. Susan tells you some of the best horror you may have missed and asks, “Are You Scared Yet?”. The Boys cover the big summer events, Flashpoint and Fear Itself. Find out what comics you need to pick up in your local comic book store with Simon’s segment, “On Shelves Now”. Susan talks to us about a few great indy books in “I Made it Myself”, and Sheldon gets a surprise from the dynamic duo! Flashpoint: Frankenstein and the Creatures of the Unknown #1 by Jeff Lemire and artist Ibraim Roberson. Birds of Prey #13 by Gail Simone. American Vampire: Survival of the Fittest #1 by Scott Snyder. Green Wake #3 by Kurtis Wiebe.